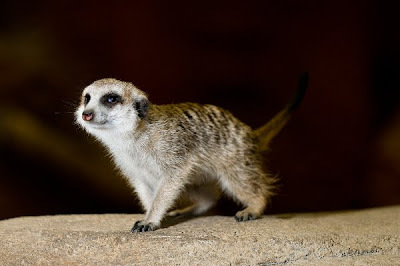 It has been 10 years since we’ve had meerkats at the zoo, but come May 1 this year, we’ll be welcoming them back with the debut of an all new “mob” of eight in an indoor exhibit in the Adaptations Building. Last week we had a chance to meet the eight meerkats moving to Woodland Park Zoo. True to their reputation, the meerkats were active, loud and inquisitive! But we managed to snap a few shots through all the action. The exhibit, presented by U.S. Bank and The Seattle Times, will open on May 1 with festivities. Right now, we’re busy molding the play area where kids will get to experience the meerkat life—crawling through burrows and playing sentinel to look out for predators. Inside the exhibit, our staff designers are recreating a semi-arid savanna habitat for the mongooses. Though it is not a huge exhibit, it will be one of the most exciting with such energetic animals—especially when we begin daily bug feedings in the summer, which will be sure to bring out the swiftness of these carnivores!